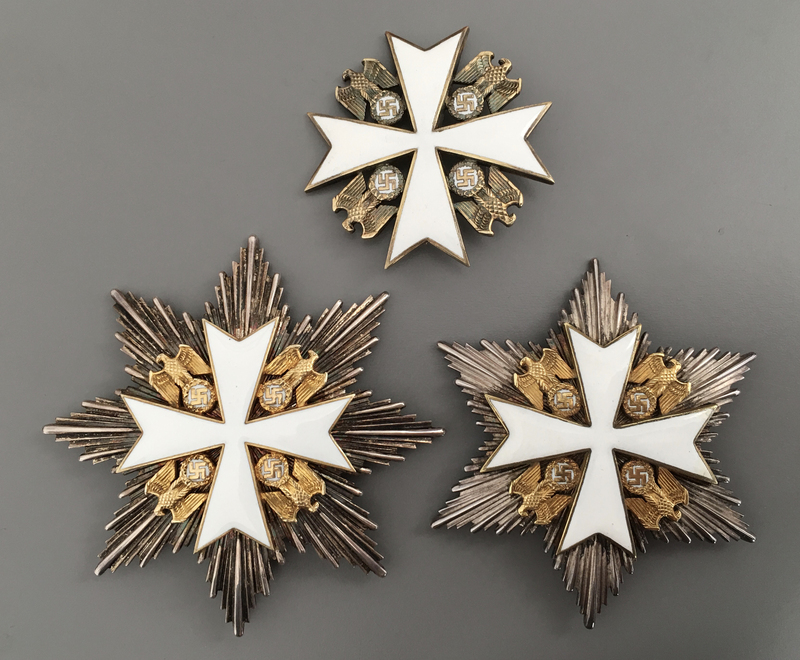 The order consisted of 5 grades, Grand Cross, Merit Cross with Star, Merit Cross 1st, 2nd and 3rd Grade as well as a Merit Medal. 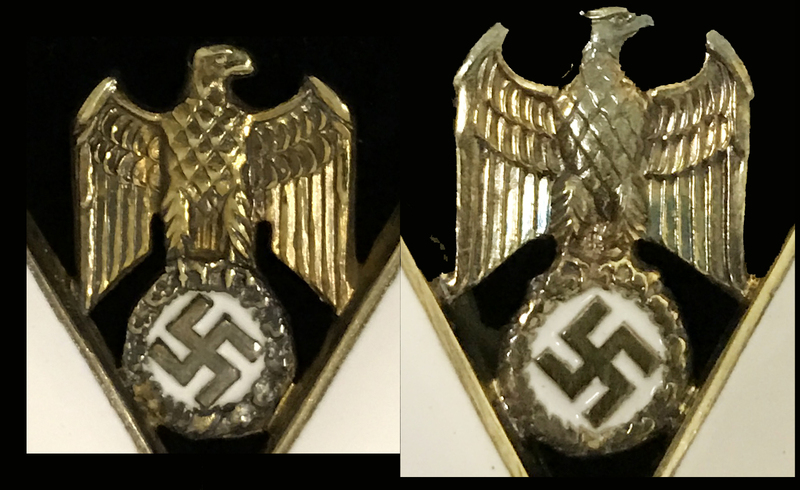 All initially awarded decorations followed a manufacturer releated, specific design until the first modification of the order’s statues on April 20, 1939. 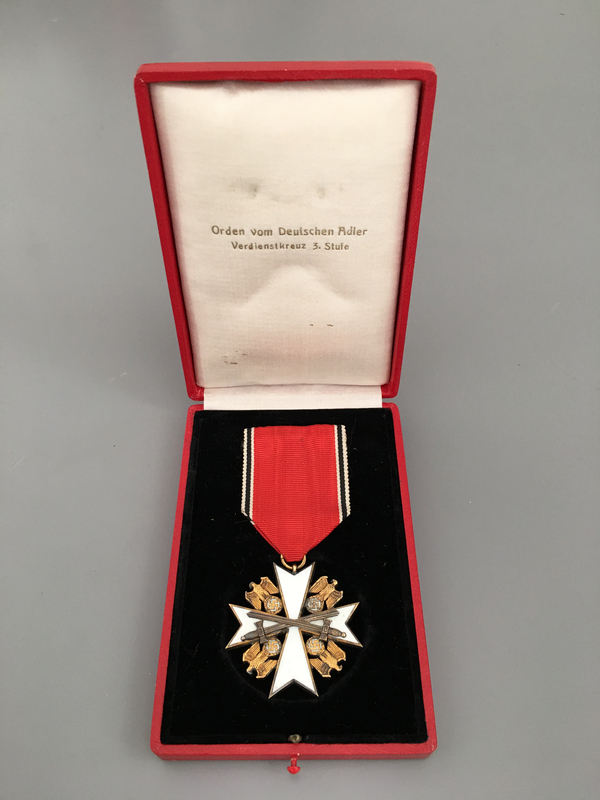 The order as well as the medal was manufactured by Deschler & Sohn in Munich2). It is assumed that a slight design changed occurred at or before April 20, 1939, with the change to its final manufacturer, Godet in Berlin. 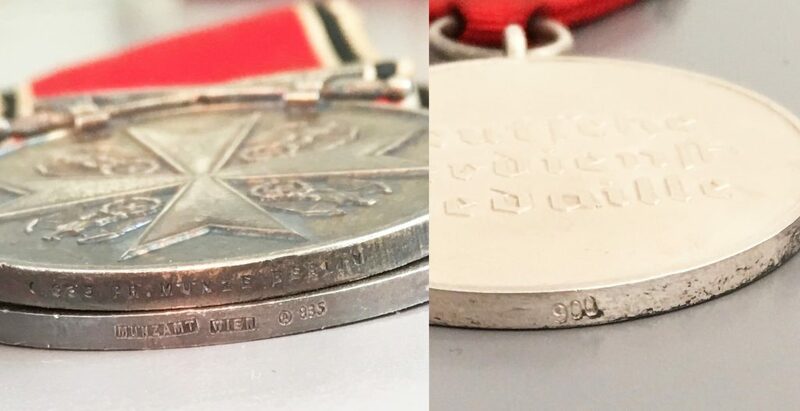 The medals were now coined at either the Berlin or the Vienna Mint. a) A more predominant design of the eagle. Figure 3: needle and reverse design comparison between 1st type to the right and one of the 2nd types to the left. 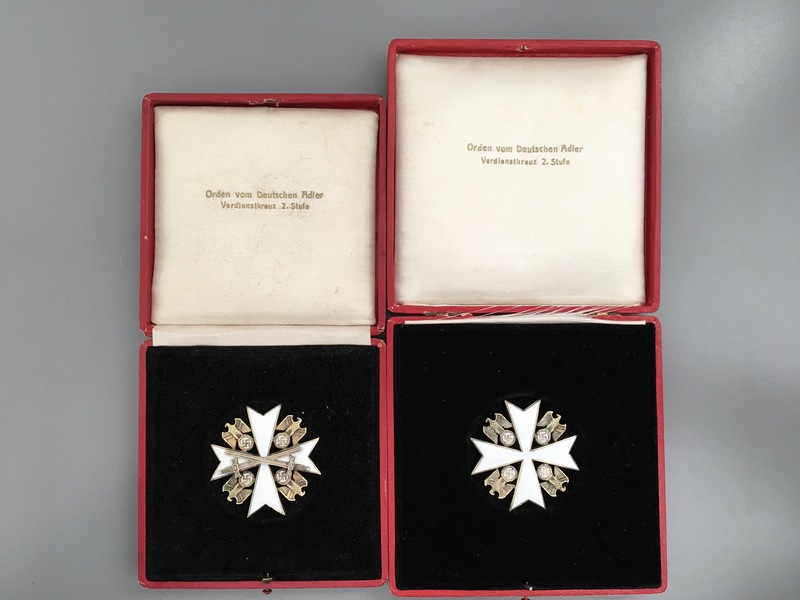 Two Grand Cross stars. 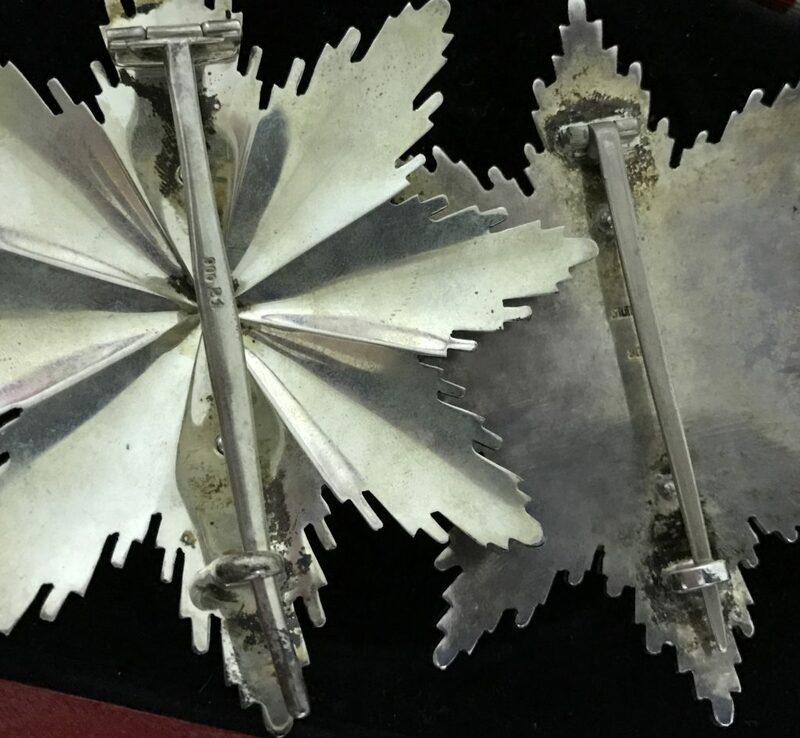 c) A simple ring shaped suspender compared to the fan suspender of the final version. 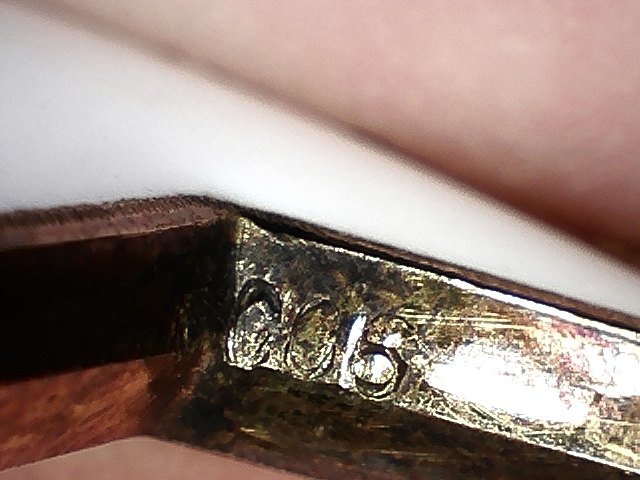 d) A metal content mark “900” on the frame of the lower cross arm of all crosses. The Grand Cross star as well as the star to Merit Cross show the word “Silber” and the silver content mark “800”, the 2nd Grade shows the silver content mark “900” and the word “Silber”. 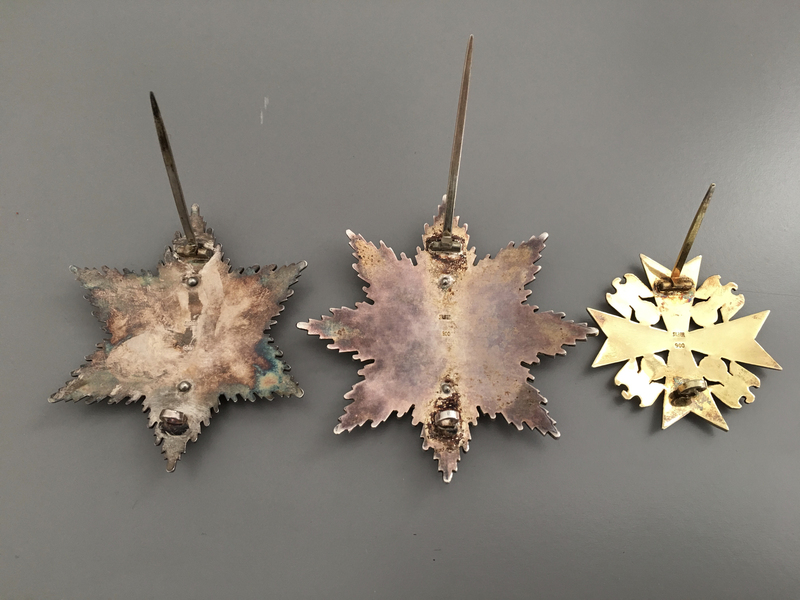 The higher silver content provides a better base for the gilding process. 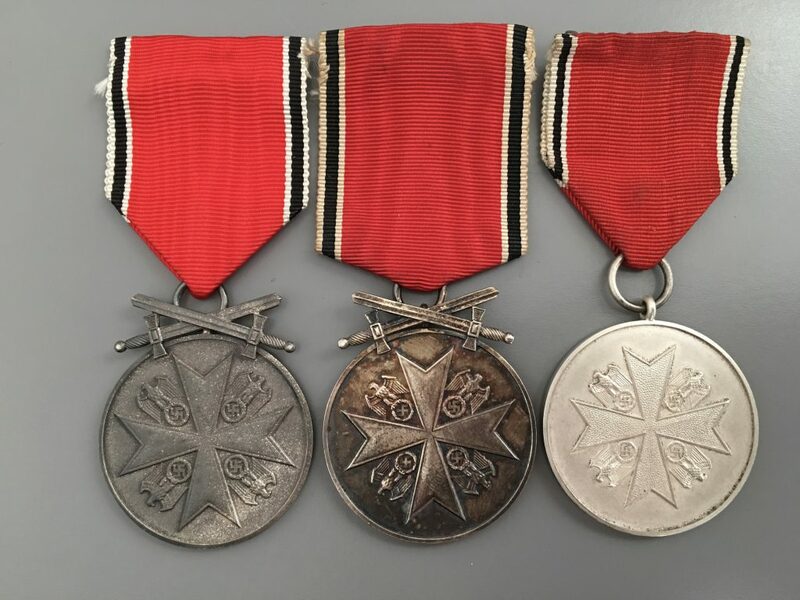 e) the design of the avers of the merit medal shows clearly not only different proof marks, but has a completely different appearance due to a stippled design of the surface within the Maltese cross. The eagles are identical in design to the ones of the crosses of the first type. 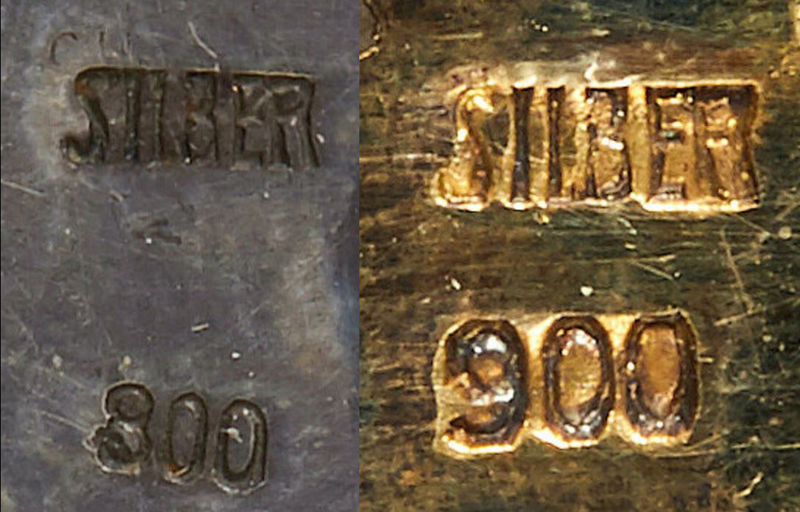 Contrary to the later type medals, the 1st type shows just a “900” silver content mark on its rim. 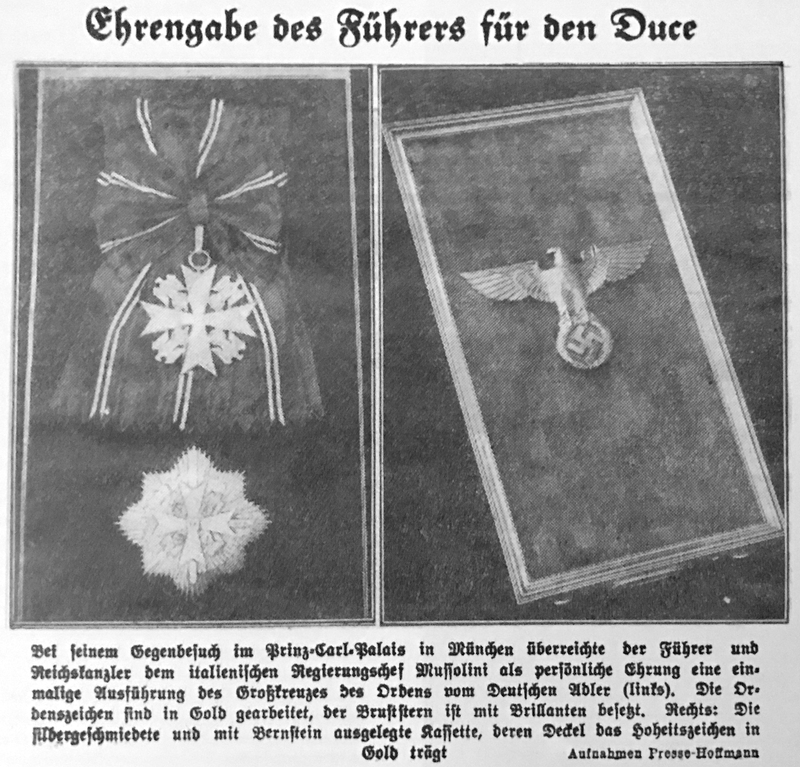 Adolf Hitler presented Benito Mussolini on September 28, 1937, with a special designed Grand Cross during his visit in Munich. The star of the set was encrusted in diamonds and was presented in a special case made from silver and amber. Despite the fact that the statues don’t allow for swords for war merit, examples can be found with swords, attached in similar or equal technique as with the final design. Figure 10 also shows the specific description of the order inside the lid of the award case. 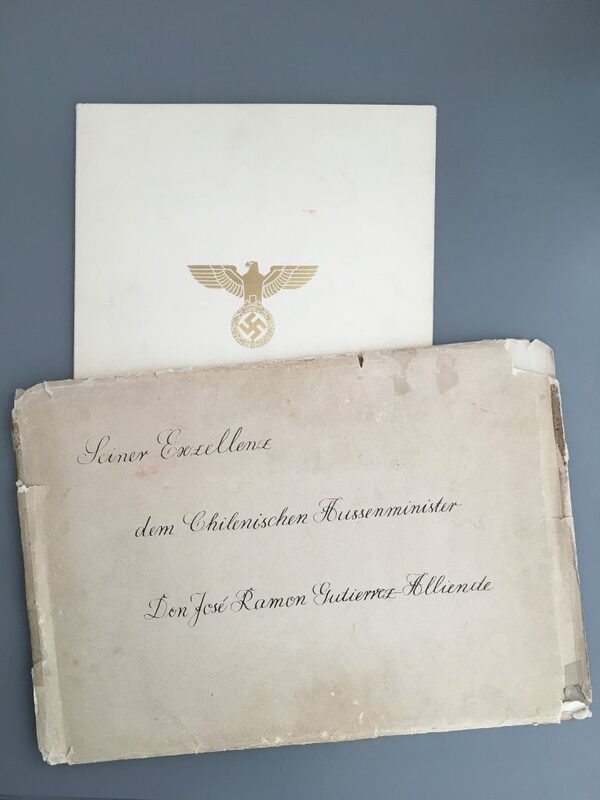 All grades are addressed as “Orden vom Deutschen Adler”. 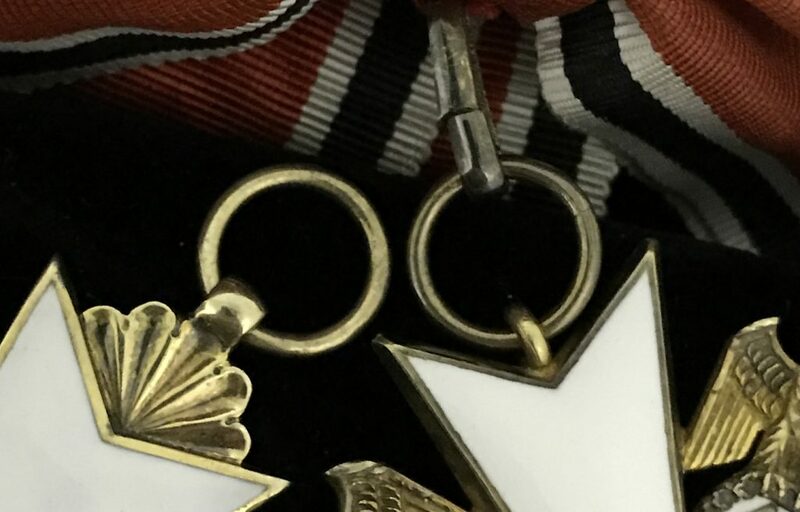 The merit Medal shows the wording “Verdienstmedaille”. 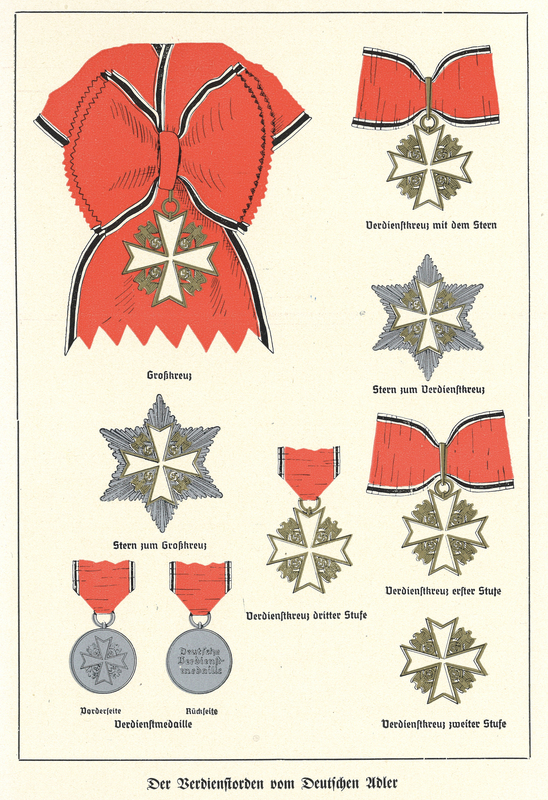 The cases are generally larger than those of the following order decorations. Yet, the transition to the smaller cases happened already during the timeframe of the 1st Type. Who received the order and its medal during the initial two years of its existence? The natural circle of recipients belonged to those living in countries politically close to the German Reich. 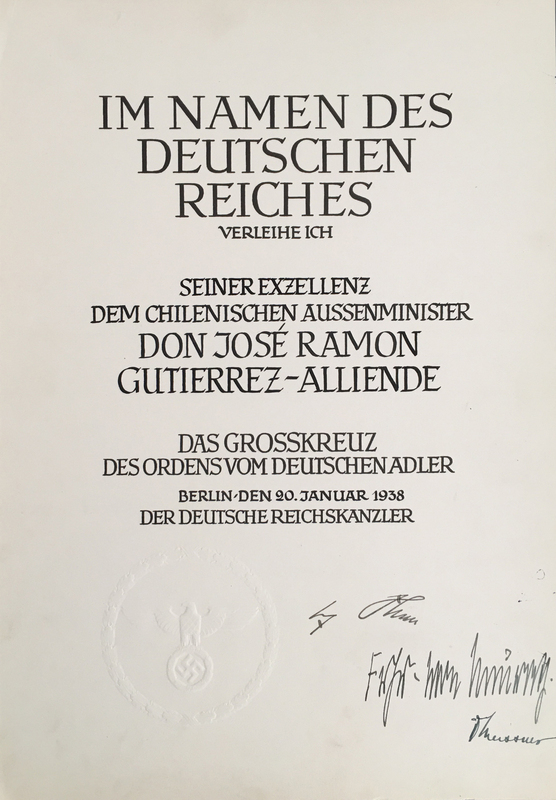 Italian and Spanish citizens were among the first to receive the new order. Yet, German friendly individuals were on the list to receive the new honor. The Chicago Tribune published a list of American recipients under the title:”…Hitler seeks friends” on November 25, 1938. Further awards to Americans occurred in 1938. Ford was also active in Nazi Germany’s prewar preparations. In 1938, for instance, it opened a truck assembly plant in Berlin whose “real purpose” according to U.S. Army intelligence, was producing “troop transport-type” vehicles for the Wehrmacht. That year Ford’s chief executive received the Nazi German Eagle (first class)4). The award documents of the 1st type came just like the later ones in a handwritten addressed envelope inside a cardboard folder. Receipt paperwork was enclosed as well. As mentioned above, the size of the cases of particularly of the lower grades were adjusted down. Here a comparison of 2nd Grade cases. The earlier larger one houses a normal 2nd Grade, the smaller one a 2nd Grade with swords. 3) „The Meritory Order of the German Eagle“, 2016, Jesus M. Franco Ruiz, Page 10. 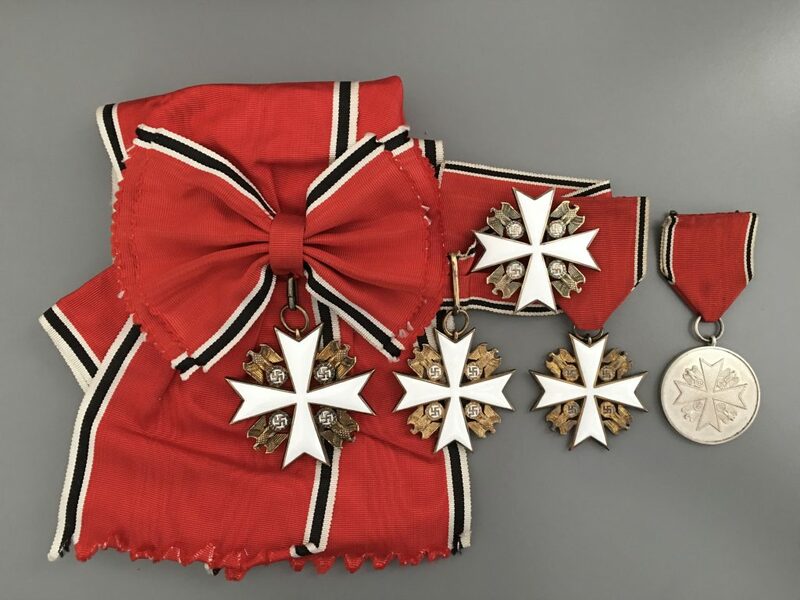 I am very curious if fellow collectors have German Eagle Orders awarded to Americans in their collections? Please post in comments. I have figure 17. With the swords. My grandfather traded it for cigarettes, all I know. 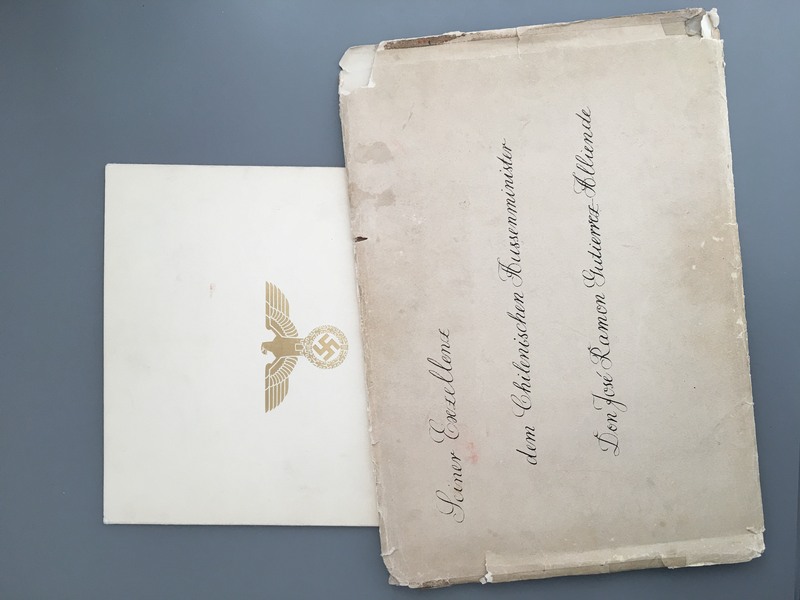 Doubtful was from a Nazi. We would love to see images.